Sitatapatra (Skt. Sitātapatrā; Tib. གདུགས་དཀར་, Dukkar, Wyl. gdugs dkar) is a female deity whose magical formulas (Skt. mantrapada) issued forth from the crown protuberance of Buddha Shakyamuni, while he was remaining in samadhi, in the assembly hall of the gods, in the heaven of the Thirty-Three. Sitatapatra gained great popularity as a powerful method to avert obstacles in ancient India and has been continuously practised up to the present day. Sitatapatra is invoked to protect the practitioners against calamities and malignant beings. Reciting her mantra is said to avert evil influences and purify defilements. Her dharani is also said to have the power of protection when worn in an amulet, the power to alter the weather and offers immediate protection in adverse circumstances. Various rituals developed around the practice of Sitatapatra, such as the fire offering, torma offering, drawing mandalas, establishing protective circles, and her dharanis were often inserted as dharmakaya relics into stupas. Sitatapatra is brilliant white, radiating with love and compassion and her body is adorned with various ornaments. In her most common form she is depicted with 1,000 heads, 1,000 arms, 1,000 legs and 1,000,000 eyes. 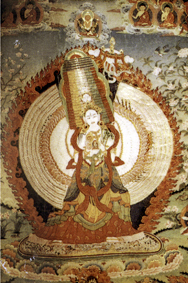 In her two central hands she holds a dharma wheel and the handle of the white parasol from which she takes her name. In her other hands she holds a multitude of various weapons. There are innumerable practices of Sitatapatra in the many Buddhist traditions in the world. The following are the four canonical texts found in the dharani section of the Dergé Kangyur, all of which are translation from Sanskrit originals. These four Kangyur texts are classified as Kriya Tantra and belong to the Buddha family. Khedrup Jé states that among the four texts, the one with the "complete subject matter" is the second (D 591). Tibor Porció argues that the first (D 590) is a further development of the second (D 591). The four texts below share a close connection in terms of structure, meaning and phrasing. Commentaries and ritual texts may be found in the Dergé Tengyur from D 3084 to D 3111. The Spell of Uṣṇīṣasitātapatrā (Skt.uṣṇīṣa sitātapatrā aparājita pratyaṅgirā mahā vidyārājñī, Tib. གཙུག་ཏོར་གདུགས་དཀར་གྱི་རིག་སྔགས།, Wyl. gtsug tor gdugs dkar gyi rig sngags., or more fully Skt. ārya sarva tathāgatoṣṇīṣa sitātapatrā nāma aparājita pratyaṅgirā mahā vidyārājñī, Wyl. ('phags pa de bzhin gshegs pa thams cad kyi gtsug tor nas byung ba gdugs dkar po can zhes bya ba gzhan gyis mi thub ma phyir zlog pa'i rig sngags kyi rgyal mo chen mo, D 590/985). The Incantation of the Supremely Accomplished Sitātapatrā (Tib. གདུགས་དཀར་མཆོག་གྲུབ་ཀྱི་གཟུངས།, Wyl. gdugs dkar mchog grub kyi gzungs, or more fully Skt. ārya tathāgatoṣṇīṣa sitātapatrā aparājita mahā pratyaṅgirā parama siddha nāma dhāraṇī, Wyl. 'phags pa de bzhin gshegs pa'i gtsug tor nas byung ba'i gdugs dkar po can gzhan gyis mi thub pa phyir zlog pa chen mo mchog tu grub pa zhes bya ba'i gzungs, D 591). English translation: The Supreme Accomplishment of Sitatapatra, translated by Joona Repo, and reviewed by the Sera Jey Translation Committee, in Practices of Arya Sitatapatra, Foundation for the Preservation of the Mahayana Tradition, 2014. The Incantation of Sitātapatrā (Skt. uṣṇīṣa sitātapatrā aparājitā dhāraṇī, Tib. གདུགས་དཀར་གྱི་གཟུངས།, Wyl. gdugs dkar gyi gzungs, or more fully Skt. ārya tathāgatoṣṇīṣa sitātapatre aparājitā nāma dhāraṇī, Wyl. 'phags pa de bzhin gshegs pa'i gtsug tor nas byung ba'i gdugs dkar po can gzhan gyis mi thub pa zhes bya ba'i gzungs, D 592/986). The Incantation of Sitātapatrā (Skt. uṣṇīṣa sitātapatrā aparājitā dhāraṇī, Tib. གདུགས་དཀར་གཟུངས།, Wyl. gdugs dkar gzungs, or more fully Skt. ārya tathāgatoṣṇīṣa sitātapatrā nāma aparājitā dhāraṇī, Wyl. 'phags pa de bzhin gshegs pa'i gtsug tor nas byung ba'i gdugs dkar po can gzhan gyis mi thub pa zhes bya ba'i gzungs, D 593). Porció, Tibor. The One with the White Parasol: Four Sitātapatrā Texts in the Derge Kanjur and a Dunhuang Text (Pelliot tibétain No. 45) with an Annotated English Translation of the Longest Canonical Version. Ph.D. Thesis. University of Vienna, 2000. Porció, Tibor. “On the Brāhmī Glosses of the Uygur Sitātapatrā Text.” In Central Asiatic Journal Vol. 47, No. 1, 2003: 91 - 109. ↑ This story of how the Sitatapatra texts came into existence is recounted in the beginning of each of the Kangyur texts themselves. ↑ Tibor Porció, The One with the White Parasol, Ph.D. Thesis, (University of Vienna, 2000), 13-18. ↑ Tibor Porció, The One with the White Parasol, Ph.D. Thesis, (University of Vienna, 2000), 40. This page was last edited on 3 November 2017, at 17:18.